Mark will be back on TV tonight to discuss the Manchester Arena bombing with Tucker Carlson live on Fox News at 8pm Eastern/5pm Pacific - and join him later this week for another edition of The Mark Steyn Show. 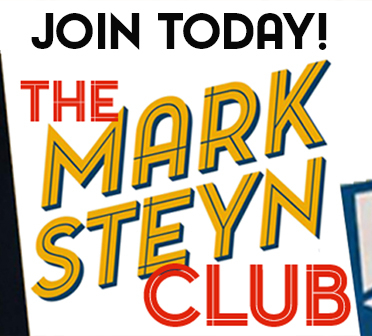 SteynPosts and The Mark Steyn Show are made possible through the support of Founding Members of The Mark Steyn Club. Among the pleasures of Founder Membership is that you can enjoy SteynPosts in any medium you desire: video, audio or text. So, if you'd rather sample the above in non-visual form, please log-in to our Audio and Transcript versions. Founding Members can also hit the comment threads and respond to Mark's responses to members' questions. So, if you disagree with anything he said, or with your fellow Club members, feel free to log-in below and have at it. If you haven't yet experienced the delights of The Mark Steyn Club and the joys of Founder Membership, please click here. There'll be a new episode of Tales for Our Time tonight, and we'll be introducing more features in the weeks ahead - including in June the first issue of our new newsletter, The Clubbable Steyn. 1:33 - 1-800-GETLOST. Listening from Charlottetown, PEI. Thank you for my morning guffaw! It's one of the things I've always enjoyed, Mark - just when the sense of impending civilizational collapse threatens to overwhelm, the conversation takes a tangent into thumb-in-braces musicals. It's hard to get depressed when watching a Mark Steyn bit. If I may, though, as one who has worked in the media production biz once or twice offer a bit of advice: be careful of your hands. There's nothing wrong with being an animated speaker, but I have noticed your hands have a tendency to end up between the camera and your face when you're getting passionate (in this and other videos). This has the effect of obscuring your face from the viewer, and the motion distracts the eye. it's a simple thing, but it makes a big difference. Dang it. It won't load for me. I've watched the first 30 seconds several times now, but that's as far as it will go. Maybe a good time to try out the audio or transcript version? Problem solved. I just needed to quit Safari and restart my computer. But I will be trying the audio versions in any case, for when I'm on the road. Thanks for pointing me in the right direction. Mr. Steyn, thank you for answering my question during this special edition of Mark's Mailbag. I also had a good chuckle when you talked about Gypsy. My daughter auditioned for a regional theater Gypsy in Philadelphia. She made it through five rounds of auditions for Baby June, but unfortunately she wasn't cast. Thanks again and I am enjoying the club. Where can I get the coffee mug? Yes, seriously. Whatever wares you have to hawk, we'll snap 'em up. Anything to help keep you solvent and producing moral clarity and civilizational confidence!